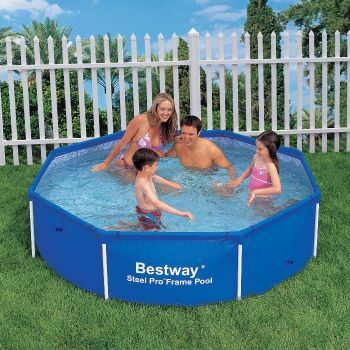 Bestway Steel Pro Octagonal Metal Frame Pool No Pump 8ft x 24"
Metal Frame Pools > Bestway Steel Pro Octagonal Metal Frame Pool No Pump 8ft x 24"
This 8ft x 24" Bestway Steel Pro Octagonal Metal Frame Pool comes with FREE DELIVERY!! This above ground swimming pool is made of a high quality steel frame, manufactuered by a leading brand, Bestway and comes in a veriaty of sizes and depths: 10ft x 30", 12ft x 32", 12ft x 48", 15ft x 36", 15ft x 48", 18ft x 42" and 18ft x 48". Due to the simplicity of this above ground swimming pool it guarentess easy installation and requires no tools! The pool is made of a heavy gauge PVC for the side walls along with a separate laminated band to help provid extra support for the walls. Along with this you also get galvanised rust resistant metal frames with this great above ground swimming pool. The 18ft x 42" and 18ft x 48" Bestway Steel Pro Steel Frame Pool PACKAGES are supplied with a deluxe maintenance kit that includes a surface skimmer. The 15' x 36" and 15' x 48" pool packages are also available with a sand filter upgrade, providing superior quality filtration. PLEASE NOTE: All filter pump units must be placed 2 metres away from the pool. We recommend that filtration is turned OFF when the pool is in operation. We recommend a smooth concrete slab as a suitable base- contact a reputable local builder for advice on local soil conditions. Failure to set up the pool on a flat, level compact ground could result in the pool's collapse or the possibility that a person lounging in the pool could be swept out. Do not lean, straddle or exert pressure on the inflatable top ring or top rim as injury or flooding could occur. Do not sit on, climb or sraddle the sides of the pool. DELIVERY CHARGE: The cost of delivery is included to mainland UK.